Today's Image of Mars shows mesas (flat topped hills or mountains) in the Cydonia region, as taken by Mars Express. One of the more prominent mesa's in this image can be seen in the far lower right. It became famous as the Face on Mars because Viking 1 Orbiter took an image of it that made it look like a human face. This created significant controversy, with conspiracy theorists claiming it was placed there by another species as a sign to humanity. It turns out the reason why the rock looks like a face is much more mundane. It just happens that the time and angle Viking 1 took the image resulted in the mesa's features being lit in such a way that it resembled a human face. 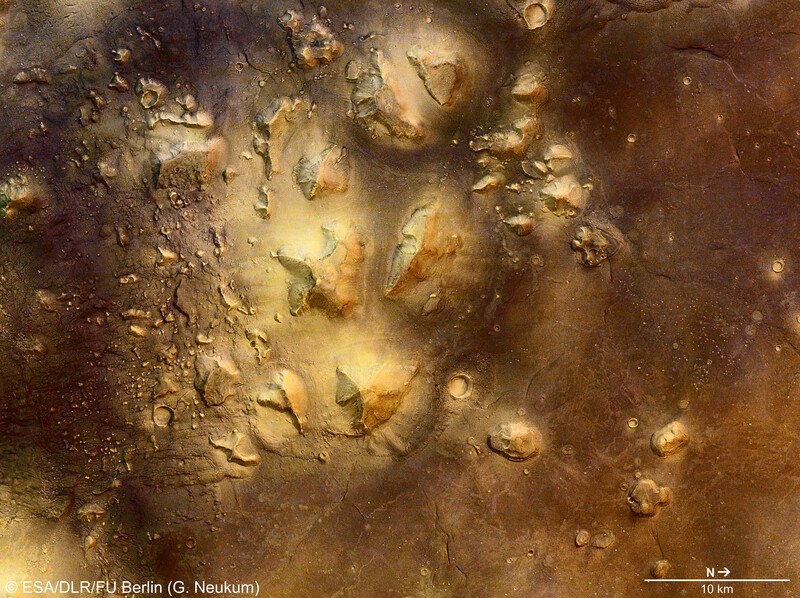 Subsequent images of the face on Mars (including this one) were taken with other orbiters and showed that it was nothing more than coincidence that the Viking 1 image made it look like a face. As you can see in this image, the face on Mars is simply an interesting looking mesa, not a sign from another species, but despite all the evidence provided since the original Viking 1 image, conspiracy theorists continue to claim cover up. Sometimes people just can't be satisfied with reality I guess. I recommend clicking on this image so you can see the high resolution version and zoom in on the figure known as the face on Mars.